TORONTO--(Marketwire - Jan 30, 2012) - The countdown to Super Bowl XLVI is on and The Bistro at the Courtyard Toronto Downtown is hosting a Super Bowl Party that will allow those attending to capture the fun and share the excitement on February 5, 2012 as the New York Giants clash with the New England Patriots. Watching the game over the projection screen at this downtown Toronto Ontario hotel's popular Bistro will be the next best thing to being in the seats of Lucas Oil Stadium in Indianapolis, Indiana when the 6:30 p.m. kick-off goes down in history for the most spectacular sporting event of the year. Great giveaways and prizes will be included at this LGBT hotel's Toronto football extravaganza, along with a special Super Bowl Menu that is sure to tantalize the taste buds. Topping the menu will be a hearty Texas Chili Bowl of slowly simmered beef and beans crowned with Canadian cheddar and Fritos corn chips. Other spicy entrées meriting this special game day menu include Nachos Supremo, warm nachos topped with cheese sauce, Jalapeno peppers, tomato and onion partnered with guacamole, sour cream and chunky salsa; a Wings and Chili Cheese Platter, boasting one and a half pounds of chicken wings plated with Chili Cheese Fries; and an impressive Gang Tackle Platter which includes six wings, five fingers and Nachos Supremo and Chili Cheese Fries. Located in the spacious lobby of the Courtyard, the hotel lounge offers flexible seating options for socializing or re-connecting. Individual media pods with 22 channels provide an excellent opportunity for privacy, while still allowing guests to enjoy the spirit of the evening. Lightning fast 100 mbps wireless Internet is also complimentary, allowing guests the fastest Internet connection of all Toronto hotels. Open daily from 6:30 a.m. to 1 a.m., the Bistro is a favorite among hotel guests and locals as well, proudly brewing Starbucks® coffees and recently introducing a new drink -- Cinnamon Dolce Latte. The Bistro offers healthy "grab-n-go" and full menu options to meet the needs of busy travelers. Guests of the Courtyard are surrounded with stylish accommodations and some of Toronto's finest attractions, entertainment and shopping venues. Savvy travelers taking advantage of the wide range of downtown Toronto hotel packages offered by this impressive hotel can create an affordable Toronto escape while enjoying all of the glamour and energy of the city's vibrant downtown. 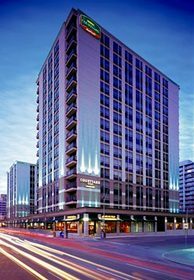 The Courtyard Toronto Downtown is the largest full-service Courtyard by Marriott in the world allowing Toronto travelers the privilege of experiencing an exceptional value in comfortable lodging. Pampering guests with well-appointed guest rooms and gracious amenities, the Courtyard also offers some nearly 14,000 square feet of flexible Toronto downtown meeting space ideal for business conferences, corporate meetings or elegant social gatherings.